I’m 31 years old but I’m not above being awestruck by a helicopter like I was when I was 8. Over the years I’ve become more sophisticated about my taste in helicopters; it takes more than a traffic copter to steal my attention these days. But a gleaming, state-of-the-art, military helicopter is still enough to make me pause in my tracks and look up, especially if it’s carrying the President of the United States. 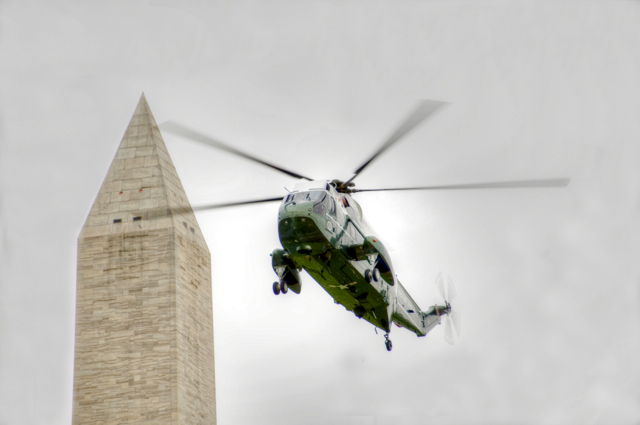 I’ve seen Marine 1 fly by quite a few times as I’ve been out walking in Washington. If you’re outside in DC for an extended period of time you likely will too. Chances are, however, that it will be too far away to get a decent picture. In this video, I’ll explain how to be in the right place, at the right time, with the right equipment so you can walk away with a photo that even most locals don’t get. Being in the right place is the easy part. 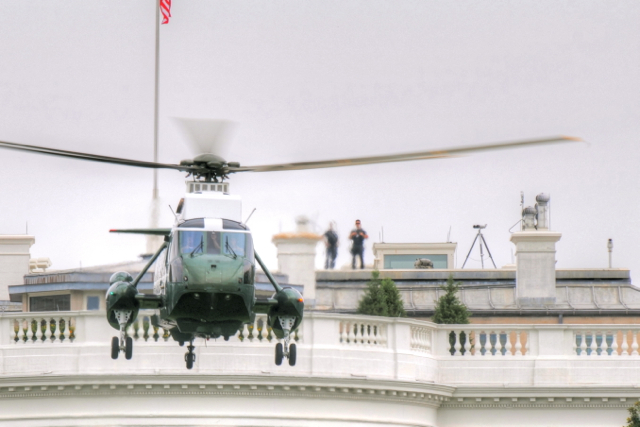 Marine 1 enters and exits the White House grounds roughly along an imaginary line that connects the Jefferson Memorial and the White House. Anywhere along that line will offer relatively close pictures of Marine 1. The best place to view this impressive helicopter, however, is on the Ellipse. About 15 minutes before Marine 1 arrives at the White House, security clears out the pedestrian walkway with a view of the South Lawn. People are also cleared out of a football field size standoff area to keep them out of the rotor wash from the helicopter; this area is marked by orange cones. At this point, the type of picture you want will dictate where you should stand. If you want to frame a photo of Marine 1 and the White House the best place to stand is at the very end of the standoff area. Be sure you get there early so you’re not taking your pictures through a crowd. If you want to get detailed pictures of the helicopter itself, then the best place to stand is off to either side to take pictures as it flies over. Finding out when to be on the Ellipse is a bit trickier. It’s a two-step process. First, you have to watch or read the news and pay attention for mentions of trips the President will be taking. This will help you narrow the timeframe down to a day. On the day of the trip you can go to the White House website and view the President’s Schedule. Look for entries that talk about departing from or arriving at the South Lawn. This schedule is subject to change but, in my experience, it’s been very accurate. If you’re only in DC for a few days you might find it easier to skip the first step and just check the schedule each day to see what’s happening. Lens: You’ll need a telephoto lens that handles focal lengths greater than 150 mm. Tripod: Tripods aren’t allowed on the Ellipse. If you’re off of the Ellipse, however, you might find a tripod helpful for handling the longer focal lengths. 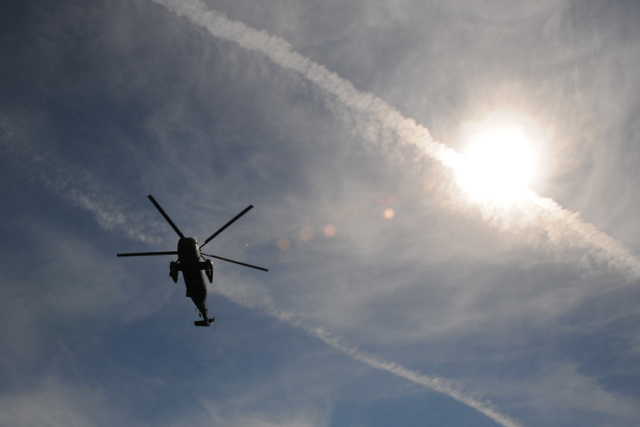 As Marine 1 traverses a bright or overcast sky you may find exposure difficult. I recommend changing your cameras settings to spot metering and meter on the hull of the helicopter. The helicopter is painted dark green so metering here may cause your pictures to come out overexposed. You can fix this by lowering your exposure compensation by 2/3 of a stop.